Our environment is overwhelmed with noise. From the blather of 24-hour news to cell phones, traffic, air conditioners, lawn mowers and leaf blowers. The Center for Disease Control actually categorizes exposure to noise as a health threat. How can our spiritual lives make space for the silence within which the Presence of God is experienced? Even if we could silence the world outside (which we mostly can't), the noise of our own thoughts and fears, anxieties and concerns can overwhelm our capacity for stillness and peace. Orthodox Spirituality has always dealt with this challenge. And thankfully, instead of seeing silence and stillness merely as the absence of sound, genuine spiritual life can enable us to find the way to use God's presence for peace and growth in our own life and surroundings. In this retreat we will explore the meaning of silence as Divine Presence within the noise of the world. Suggestions will be offered on how we may imitate those who triumphed over their hardships and struggles in this world to reach and apply God's peace and strength in their own life. To register for the retreat, please email Helen Koonz at helenkoonz@msn.com, or call 972-422-0805; or Hayfa Hawa at hhawa@verizon.net, or call: 972-491-9071. *About Fr. John Mikita: Fr. John was born and raised in Pittsburgh, PA. While his great grandparents were Orthodox and founding members of St. Nicholas parish (OCA) in Weirton, WV, he was raised Episcopalian. After attending Washington and Lee University he went to an Episcopal seminary and served as a clergyman of the Episcopal Church for five years before converting to Orthodoxy. He served St. John the Baptist Orthodox Church in Black Lick, PA. In 2008, Fr. 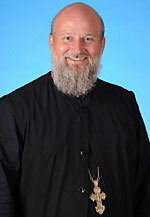 John and his family moved to Tyler, Texas, to become the first full time priest of St. John of Damascus Mission, and he is an adjunct lecturer in religious studies at UTTYLER where he teaches Introduction to Christianity. Fr. John is married to Matushka Christina, and they have two children, Alexander and Rachel.